The short answer is ENERGY! 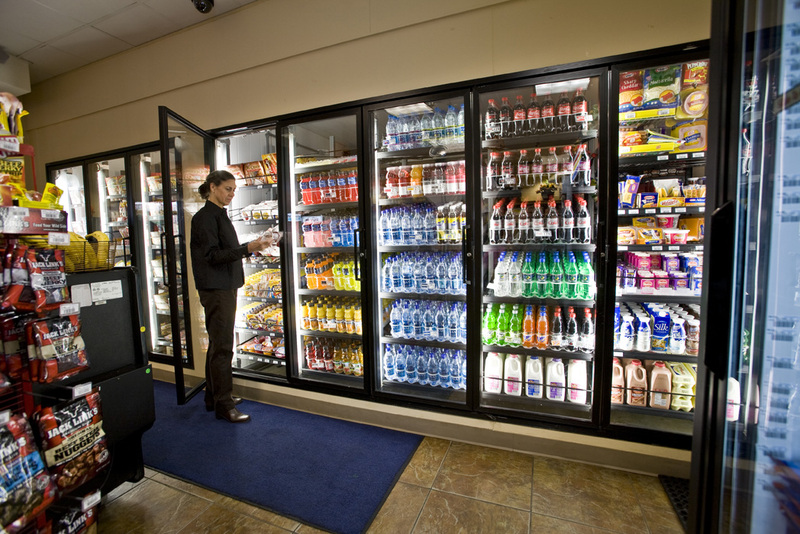 Most retailers recognize that refrigerated display cases with doors use a lot less energy than open display cases. The Better Buildings Alliance recently published a useful guide on retrofitting open refrigerated display cases with doors. Adding doors to open cases greatly reduces cold air loss, which results in a 50-80% load reduction and significant system energy savings. Additional benefits include increased shopper comfort, increased product life, and reduced product losses. Retailers initially feared that adding the glass display doors would hurt the merchandising effort, but the vertical display has in many cases improved merchandising. The refrigeration load will drop significantly after adding doors, so it makes the most sense for the existing refrigeration system to modulate to adjust to the lower load at all outdoor ambient conditions. Controls on the anti-condensate (anti-sweat) door heaters will ensure that extra energy is not wasted here. The retrofit process is a good opportunity to make additional energy upgrades to the cases, including lighting and fan upgrades. In this case, you can’t tell what’s behind the door until you put one on!